By crossword games here, I'm talking about word games where the basic idea is to build up an interlocking grid of words. In other words, a crossword game is a kind of hybrid offspring that you get by mating a Crossword Puzzle with a Scrabble game. There are lots of ways to do this, of course. Some more fun than others. On this page, I've listed the ones that I think have a bit of mojo. 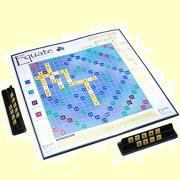 Recipient of a Dr. Toy Best Game Award and a Parents' Choice Award, Equate engages and challenges students of any skill level. As with the familiar crossword tile game, players arrange their tiles horizontally or vertically on the 20 x 20 grid, but form numerical equations rather than words. Created by a collegiate mathematics instructor, the game helps students develop their creative thinking skills, master arithmetic concepts, and practice algebraic reasoning in a stress-free and enjoyable setting. On the surface of it, Upwords looks just like a 3-dimensional version of Scrabble. Actually, though, its scoring and letter-placement rules make it a different game altogether. Unlike Scrabble, players are allowed to place letters on top of existing letters, as long as they form valid words in the process. The more letters underneath any letter you play, the more you score - so forming high stacks is the name of the game. Also, the board has no premium squares (Double-Letter Squares and so on), and all letters have a face value of just one point (so you won't be saving up the Z to destroy your opponent on the last move!). This completely changes the nature of the game. 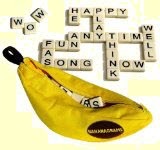 In particular, anagramming becomes less important, because you get greater rewards for replacing letters in an existing word, than for making a completely new word by unscrambling the letters on your rack. Which words are you allowed to use? The rules for valid words are the same as in Scrabble, so I recommend you use the Official Scrabble Dictionary.